Chile's former military leader, Augusto Pinochet, has been placed under house arrest for crimes committed at a detention centre in the 1970s. Judge Alejandro Solis had on Friday charged the 90-year-old general with kidnap, homicide and torture. The Villa Grimaldi centre was run by his secret police, where thousands were tortured between 1974 and 1977. 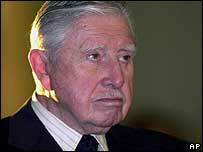 More than 3,000 people were killed or "disappeared" when Gen Pinochet was in power from 1973 to 1990. Judge Solis questioned the general in connection with the Villa Grimaldi case and declared him "lucid and aware of the consequences of his words". He is being processed over 36 kidnappings (or disappearances), one murder and 23 cases of torture committed at the detention centre used by the secret police. Gen Pinochet enjoys legal immunity as a former president, but the courts can strip him of this privilege on a case-by-case basis. This has happened in a number of human rights and financial cases. The former leader was under house arrest for seven weeks last year, over the disappearance of three dissidents during his rule. He has yet to be cleared or convicted in any cases, some of which have been dropped because of his ill health. His lawyers have argued he is too infirm to stand trial.